Bangalore is considered as bar and pub culture hub since a decade now. To experience high-end night life visit Indiranagar, located in east Bangalore. It is the most vibrant and living place to have casual as well as luxurious dining. This spot in Bangalore, is also considered as nightlife hub, having a hip vibe. Bangalore not just have a huge array of restaurants, pubs, bars and craft breweries, but also is pretty famous for shopping, from home to fashion stores, international brands, boutiques and lot more. Must have foods to try here are- Idly Dip Sambhar, Bisi Bele Bhath, Gobi Manchurian, All-Day Breakfast, Bun Nippat, Momos, Steaks, Craft Burgers and much more. So, whenever you visit the city, do checkout our List of Best Restaurants in Bangalore! Located at Old Airport Road, this place offers ultimate rooftop seating, amazing dance floor with some delicious cuisines to enjoy. This place is apt for romantic weekends and also to handout with friends. Toit, offers the best nightlife experience to hang out with friends and family. This place is best suitable for continental food loves. Toit has 3 floors with overwhelming crowd during the weekends. Chennai is the capital of Tamil Nadu and the fourth largest city in India. Popularly known as 'gateway to the south'. It is also considered as the third largest commercial and industrial hub of India. Just like most of the cities in India, Chennai also boasts a vibrant nightlife. Their incredible culture reflect in its food palate as well. 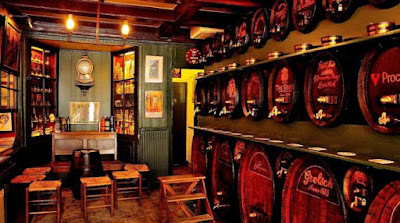 City has some rocking Hangout spots with the presence of the Best bars and pubs in Chennai. So, whenever you visit Chennai, checkout our picks on Best bars and pubs list below. Located in Nungambakkam, this spot is known for its multi-cuisine along with their uber cool DJ. They specialize in Pork Belly, Bell Pepper Hummer along with wide range of international cocktails to go along. This place is located in Kodambakkam, known to serve everything from American to continental food. Big Bang Theory is a restrobar and is one of the most popular among bars and pubs in Chennai. Online proctoring services - Is it the Future?